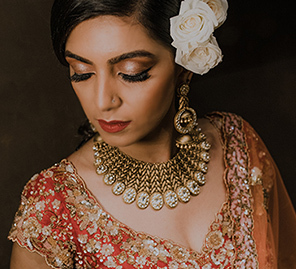 Sahiba’s elegant choices transformed her into a stunning bride-to-be thanks to some WeddingSutra Favorites. 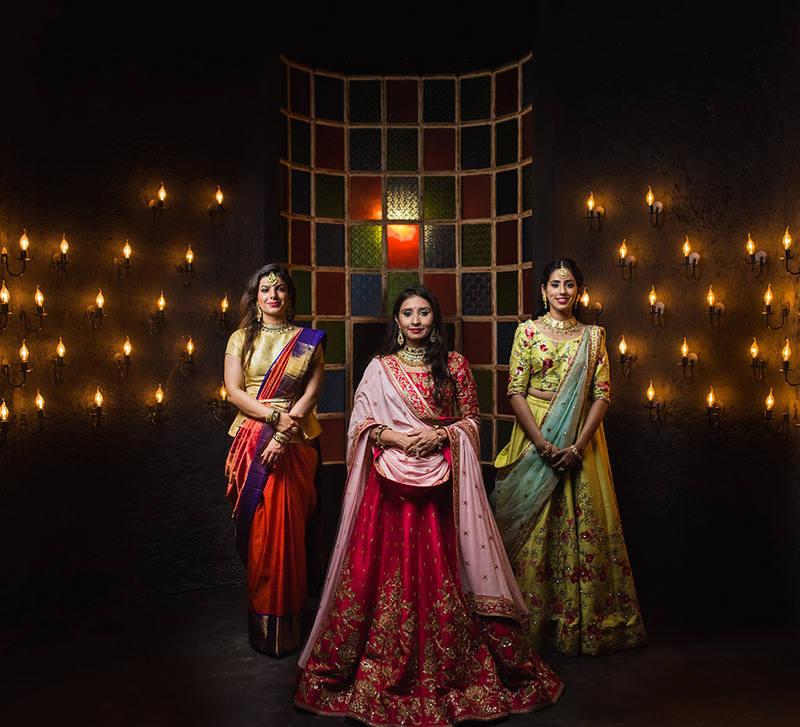 WeddingSutra, in collaboration with Kalyan Jewellers and Lakmé Absolute, brings you WeddingSutra on Location – a curated showcase of top bridal trends and style statements from some of the WeddingSutra Favorites. WeddingSutra’s most popular bridal initiative was held at the beautiful Shyamal & Bhumika Studio at DLF Emporio in New Delhi. In the first of this three-part series, Sahiba is given a dream bridal look inspired by the bold vintage mod makeup of the dynamic 1980’s. The 80's was loud and proud and definitely quite unique style-wise. Nearly 40 years on, this look has the vintage nod and with a little confidence, any bride can rock it. 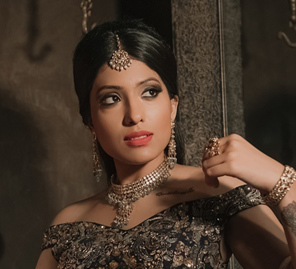 Sahiba had her mind set on an elegant bridal look with a touch of vintage glam and she looked fabulous. 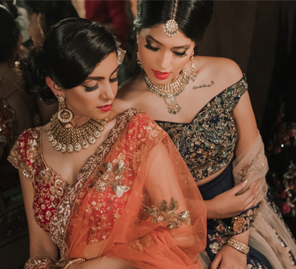 The bride-to-be shares her bridal makeover experience that included wearing handcrafted jewellery by Kalyan Jewellers, a gorgeous green and orange heavily embroidered lehenga by Shyamal & Bhumika and with makeup by Shruti Sharma who created a stunning look using products from Lakme Absolute. As the bride-to-be enjoyed the day underscored by vintage magic, the photography team of Infinite Memories captured her excitement and the most remarkable moments on their cameras. Sahiba began by picking an outfit that resonated with her personality; an orange and green lehenga resplendent with floral embroidery and pretty accents. Then, browsing through the intriguing Kalyan Jewellers’ range on display at the studio, she had trouble picking her favorite from the beautiful sets before her. She tried different pieces on with her outfit and finally found the one! “The jewellery is absolutely stunning!” she exclaimed, before sifting through other options to pick a ring and bangles to go with her attire. Using the finest products from the Lakmé Absolute range, Shruti Sharma gave Sahiba a girlish yet elegant look. She accentuated her eyes with kohl and mascara to make them appear brighter and more defined. The bride-to-be looked 1980’s runway ready and stylish as each step of the makeover got underway. Shruti started with the Lakmé Absolute Skin Natural Mousse – Hydrating to give Sahiba’s skin a healthy glow. Using the Lakmé Absolute White Intense Wet and Dry Compact she set the foundation and had a clean base to work on. She lined her eyelids using the Lakmé Absolute Forever Silk Eyeliner in Blacklast and used Lakmé Absolute Flutter Secrets Dramatic Eyes Mascara to darken the lashes. The Lakmé Absolute Face Stylist Blush Duos gave Sahiba a flush to her cheeks while the Lakmé Absolute Matte Melt Liquid Lip Color in Vintage Pink made for a perfect pout to finish the final look.